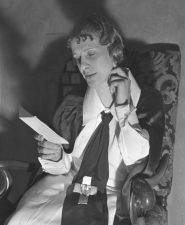 Aimee Semple McPherson could put on a theatrical church services like nobody’s business. The flamboyant Pentecostal faith healer “helped drive the rise of a new mass media, celebrity culture” and became one of the most famous celebrities of her time. According to Costi Hinn of Equip the Saints there was a side to this woman that few are willing to tell. Hinn, however, is willing to tell us her story. One of the astonishing things he reveals is that “students of signs and wonders schools still flock to her gravesite in Glendale, California to lie on her tombstone and ‘soak’ in her anointing so they can operate in ministry as she once did.” This practice is called “grave sucking,” brethren. Watch this video. Some deluded people actually do this, as you will see. On this date, September 27th, 1944, one of the most famous female faith healers in history died of an overdose from sleeping pills that sent shockwaves through the world. While she is known for her ecumenical work and for being the founder of the Foursquare denomination, it is her life and theology as a pastor that few ever stop to ponder. For better or for worse, this is a side of Aimee Semple McPherson’s story like you may have never read before.